This entry was posted in 2013 and tagged babies, Guardian, news, newspapers, replublicanism, royals, Sun by Andrew Collins. Bookmark the permalink. Hear, hear! Well said, Andrew. Perfectly encapsulates my own feelings towards this apparently momentous event. I didn’t care when the sainted Diana gave birth; I certainly don’t feel moved to give a toss that her progeny are also capable of reproduction. A stranger in a strange land indeed. 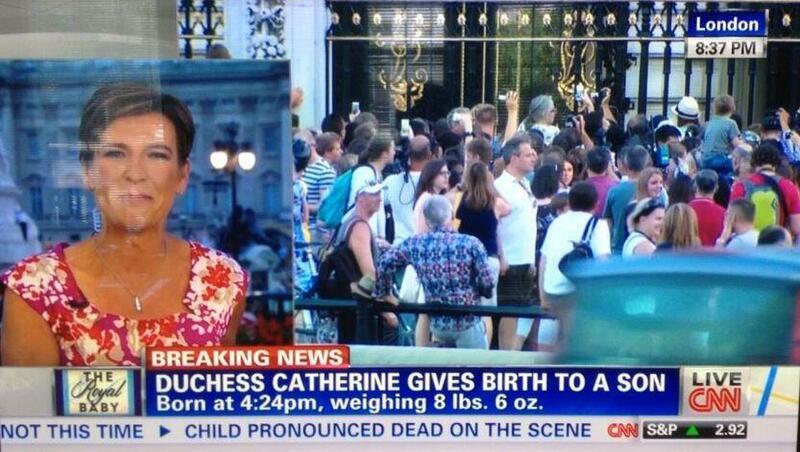 I too couldn’t give a toss about the royal birth. What I do care about is that it’s being used by the TV companies to throw the schedule in the rubbish bin and fill the time with all this royal baby rubbish. For goodness sake, it’s not as though a human birth is a rare event. My twitter feed last night was full of people who didn’t care (and much worse) and now I read this from one of my favourite writers. Which leads me to the question, if you claim to not care, why has everybody spent so much time writing about the fact that they don’t care? Because the majority of the media assumes that everyone cares, and when you don’t care, you feel as if your voice doesn’t count? I do not “claim” not to care. I do not care. I am also a writer and a blogger and choose to articulate my feelings through this medium. I think you’ll find that there’s an awful lot more comment and writing out there to support the “everybody cares” assumption (or, in Cameron’s words, “everybody is excited”). Isn’t freedom of speech all about being able to speak with freedom? I agree. It’s tedious. And it’s going to run and run..
To paraphrase Marx – “Royalty is the opium of the masses”. Also shame you included the front page pictures otherwise I would have not seen them at all! It’s so useful to have you around to articulate what I think on pretty well everything. I don’t *think* I’d jump off a cliff if you told me to, as mums everywhere would say when told “But everyone else does”, but it is useful! When I recently visited the UK, my traveling companion wanted to see the royal jewels at the Tower of London. I had no interest in that–what I kept wondering was why you still had royalty, and I was told that they are important, and I still didn’t understand. I found myself wrapped up in the grief over Diana’s death at the time it happened, even though I figured that if she’d been driving her own car, like a real person, or if she’d had the sense to wear a seat belt–well, it was a death caused by having too much money, like John Denver’s death or John Kennedy Jr.’s death or many other deaths of wealthy people. I realized that it was TV that made me care, and now I can’t even remember why I cared. Since I no longer watch broadcast TV, I avoided the hype, and appreciated The Daily Show’s brief series on the Royal Cervix. Not only was this a welcome read but, with reference to one of the comments above, I do value the fact that you have gone to the trouble of telling us you don’t care in such a calm and diplomatic manner, expressing no malice towards the actual couple involved. Those forcing the coverage down our throats (I couldn’t face buying a paper this morning) do need to know there are differing voices and opinions out there. They could also do with adopting the same matter of fact approach when reporting an item of news, worthy purely for constitutional purposes, but nothing else. Richard, I suggest you buy the I. Minimal coverage in there and Grace Dent wrote something along the same lines as Andrew. In spite of being dumbfounded by the levels of enthusiasm towards the Golden Jubilee and The Queen herself last year, I still failed to anticipate the insanity yesterday. Although I wasn’t stupid enough to expect a rational, brief report, I really didn’t think there would be a special programme before the news, then almost the entirety of the news, then another special programme after the news, when there was NO NEWS! Woman has baby, baby weighs this much, they are well – that’s it, that’s literally all the facts there are to report. The only aspect of the whole farrago that saved me from feeling as much of a misfit outsider as you clearly felt, and as I felt in 1997 when the whole country seemed to indulge in mass hysteria, was the occasional comment from BBC reporters along the lines of “For people who take an interest in the monarchy, this is a time of great joy” – a subtle acknowledgment, albeit swamped in a deluge of monarchic propaganda, that we are out here. You’re certainly not the only one; apart from my mother who I spoke to on the phone last night and mentioned it briefly, no-one I know is really bothered about it. I guess there probably is a lot of media coverage going on, but I’ve not really taken much notice of it. In fact this blog entry is the most I’ve read on the subject! My cousin’s due to give birth any day now, and that’s far more exciting. To me. Love your writing Andrew – so often articulates what I’m thinking. I think the only thing I cared about when I saw any Royal Baby-related news was the comparison between the cost of her private suite and the cost in the US of a normal birth; that was at least half interesting, even if they missed a few pieces of information. This baby boy news mess is the Conservatives’ doing or at least big influence, no doubt.